For the beauty of your teeth, use your free time on holiday! for particularly gentle and superior whitening results. - cheapest price on the whole island! Teeth bleaching Majorca on Holiday? It´s never been so easy, in addition to a tanned skin now you can go back home with a radiant smile. ABSOLUTELY NO PAIN AND IN JUST ONE HOUR! Clinical studies have shown that the tooth color can be lightened with a professional teeth whitening at the dentist office from 5 to 8 shades. In this so-called bleaching gel is applied to the teeth and activated using a Whitening lamp. Qualitative bleaching materials from Germany, which over 1200 dentists use for many years, maintain your teeth still during treatment and provide the dentine with fluoride and potassium. Why choose teeth whitening treatments in the dental office? In the professional teeth whitening at the dentist office a careful examination of your teeth is made. Here the dentist can tailor the treatment to your individual needs. Needs such as, sensitive teeth whitening, special materials or a customized course of treatment. Tooth whitening at the dentist is also the fastest and most effective method of whitening. Within an hour, it's all over and a bright white smile is yours. For whom is the treatment appropiate? Basically, the treatment is suitable for anyone having teeth discoloration, either from tobacco, tea, coffee drinking or other coloring food ingredients, such as Cola. Here, even stubborn stains such as the ones caused by taking antibiotics, fluoride or other drugs can be effectively removed. 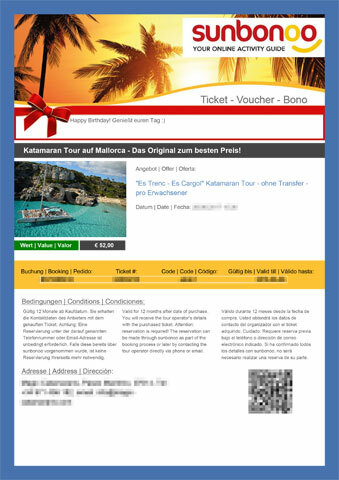 Dates of reservation about a German hotline possible (contact details are on the purchased ticket). have white teeth again, hammer. As heavy smoker my whitening helped. Thanks to competent dentist in Palma. Again any time. hab wieder weiße Zähne, hammer. Als starke Raucherin hat mir das Bleaching sehr geholfen. Danke an kompetente Zahnärztin in Palma. Jederzeit gerne wieder. and true. Has lasted only 1 hour 10 minutes and I now have white teeth. no longer come away from the mirror. As Schisser going to the dentist, I can confirm it did not hurt. highly recommended. und stimmt. Hat nur 1 Stunde 10 Minuten gedauert und ich hab jetzt weiße Zähne. Komm gar nicht mehr vom Spiegel weg. Als Schisser vorm Zahnarzt kann ich bestätigen, es hat nicht weh getan. sehr empfehlenswert. You're reviewing: Bleaching Majorca: white teeth, absolutely painless and only 1 hour duration. How do you rate this product?